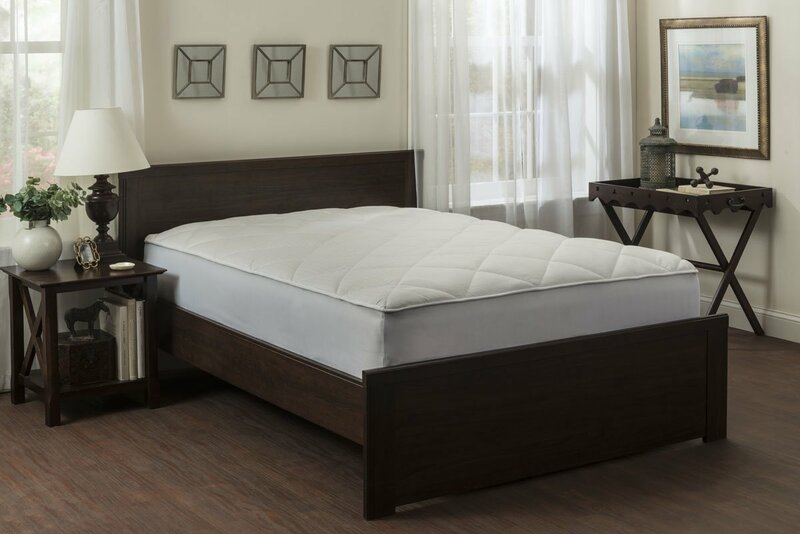 Protect your mattress while adding comfort! 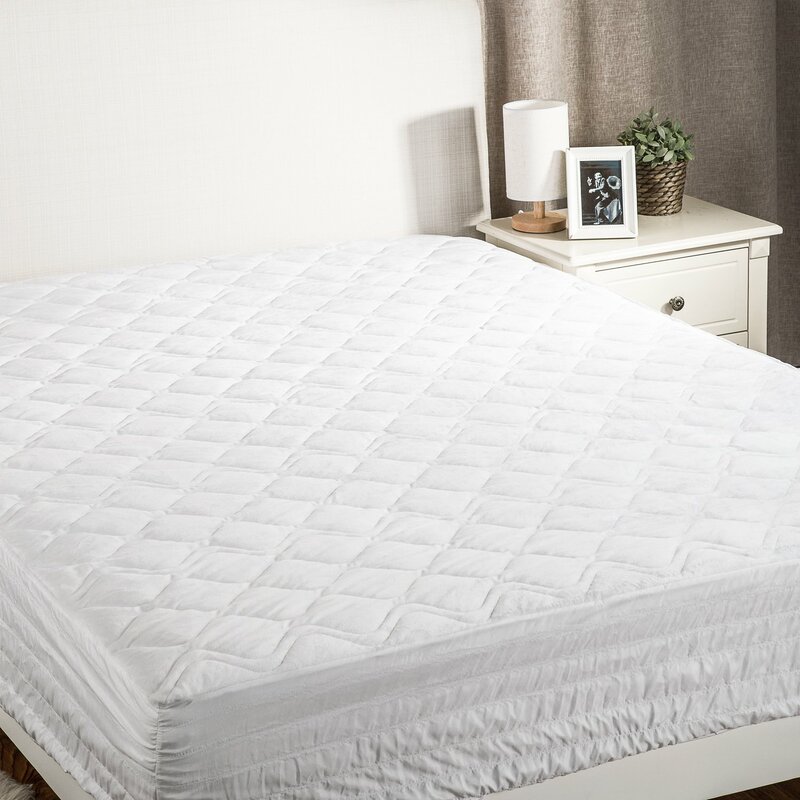 This down alternative Mattress pad is truly luxurious and it’s allergy free. The dot design gives it that fine classic touch. The mattress pad won’t slip off of your bed! SIZE & DESIGN – Available in twin, twin xl / twin extra long, full, queen, king and california king sizes. King measures 78″ x 80″. Deep pocket design fits all mattress depths up to 18″. Fully-elasticized fitted sheet style automatically pulls excess material under the mattress to ensure a great fit. End-to-end stitches with mitered border to prevent fill from shifting. Body friendly design for the ultimate comfort experience. 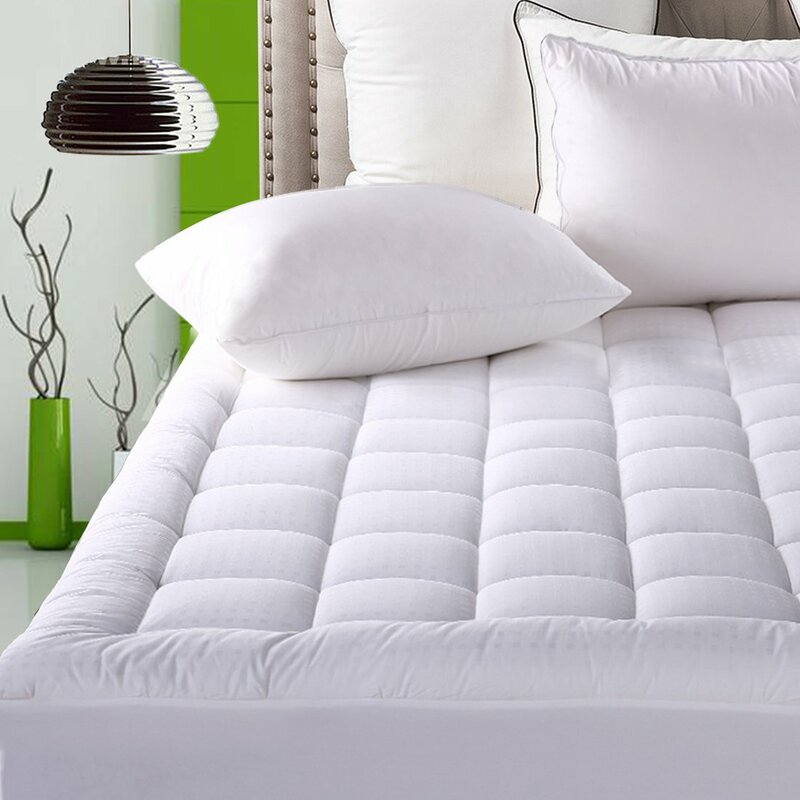 Hypoallergenic and Antimicrobial: Filled with snow down alternative fill, a state-of-the-art fiberfill that has the feel of authentic goose and duck down without the feathers, poking or allergies, the mattress pad can not only keep your mattress free of stains, but prevent exposure to dust mites and other potential allergens, offering sweet nights without runny eyes or stuffy noses. Water resistant to a certain extent: Although the cover is cotton, the spilled fluid can be wiped quickly. 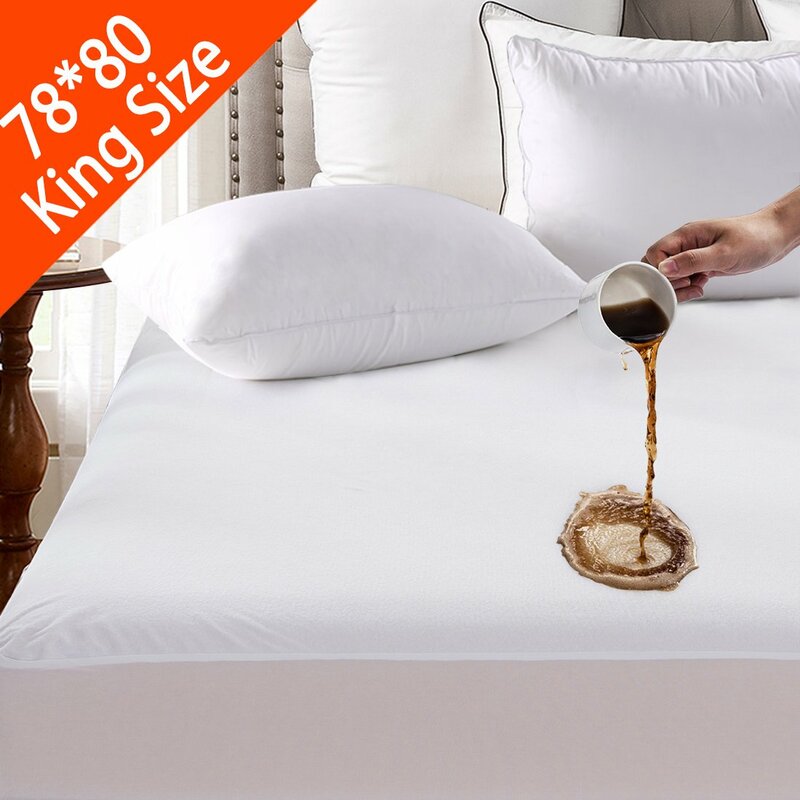 And due to its thickness, the fluid will not soak the mattress if it’s less than 200ml. Feel free to enjoy your breakfast on bed. Fits mattress up to 21 inches:King 78″X80″ The fabric sides easily stretch to fit mattresses up to 21 inches thick. It will never slide no matter how you twist and turn in your bed. TOP QUALITY FABRIC: Super Soft and Comfy, Polyester/Cotton Top – For Utmost Sleep Comfort. STAY COMFY ALL NIGHT! Cushiony Filling – Supports Your Body and Mattress in the Same Time. FITTED SHEET STYLE: Knitted Skirt – Stretches To Fit Up To 18” Really Deep and Fits Large Mattress perfectly. EASY TO CLEAN: Machine Wash cold water hang or lay flat to dry – For Practical Use. Did Not Shrink After Washing. HOLDS UP WELL: Hypoallergenic & Comfortable to Sleep on Without any Noise. Nice & Tight Stitching Pattern! The cover is machine washable and tumbled dry on low. Do not bleach. Easy maintenance. EASY TO KEEP IT CLEAN: Machine washable, which adds the convenience of washing and drying is so Easy. Swiss Cooling Technology: As you sleep, cool breathable fabric responds to your body temperature, when you heat up, moisture is wicked away more quickly to keep you cool, when you cool down, wicks moisture more slowly to keep you warm. 3M Stain Release And Water Repellency Treatment: Stain Release helps prevent stains on the mattress and allows them to be easily washed away for a more sanitary sleeping surface. Water Repellency treatment protects mattress from leaky messes and spills. with 3M protection, the lifespan of your mattress is maximized. Easy To Clean: Machine washable, no pilling for repeated use. Four seasons general and cost-effective. Care: Although the cover is cotton, the spilled fluid can be wiped quickly. Machine washable.Tumble dry on low.No bleach.Easy maintenance.Natural drying. AWESOME SOFTNESS: Ultra-Soft and Comfortable, Cushiony Microfiber Top, Down Alternative Filling. 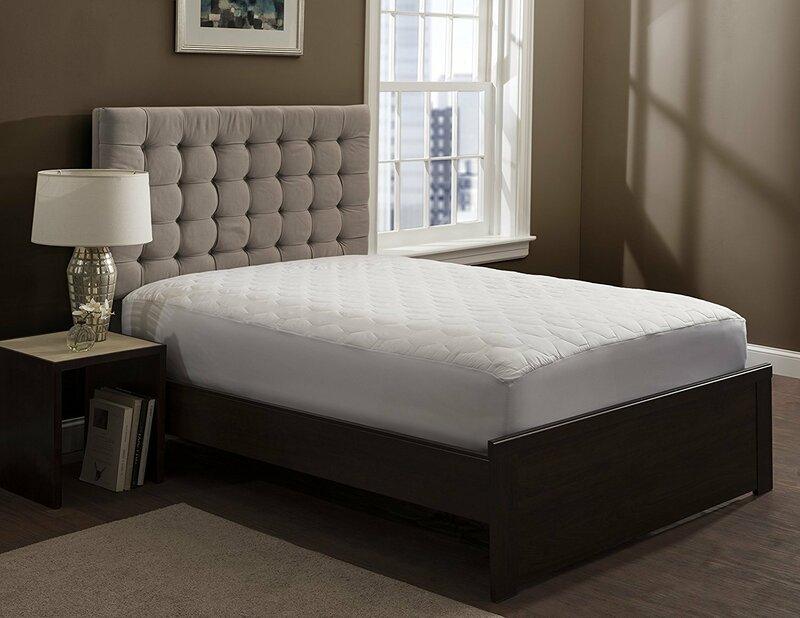 FITTED STYLE PERFECT FIT: Super-Stretchable Sides, Will Hug Your Mattress Tightly & Stay In Place! HIGH QUALITY. Fluffy Down – Like Microfiber Filling, Comfortable & Soft Microfiber Fabric. EASE OF CARE. Machine wash Cold Using Mild Detergent. Tumble Dry Low. Remove Promptly. NO RISK PURCHASE: 100% Quality Guaranteed: Customer Satisfaction Is Our Top Priority. Protect the Back: The new Sonoro Kate mattress pad has 10 OZ of stuffing than other mattresses pad on the market, which heavy the thickness of the mattress pad, better protects your back muscles when you sleep, and makes you wake up every morning no longer sore. Cooling Mattress Pad: The use of 300TC 100% cotton is more breathable and soft. It protects your back and doesn’t make you feel heat, dark grey mattress pad, hypoallergenic, and dirt-proof. It’s easy to clean up. 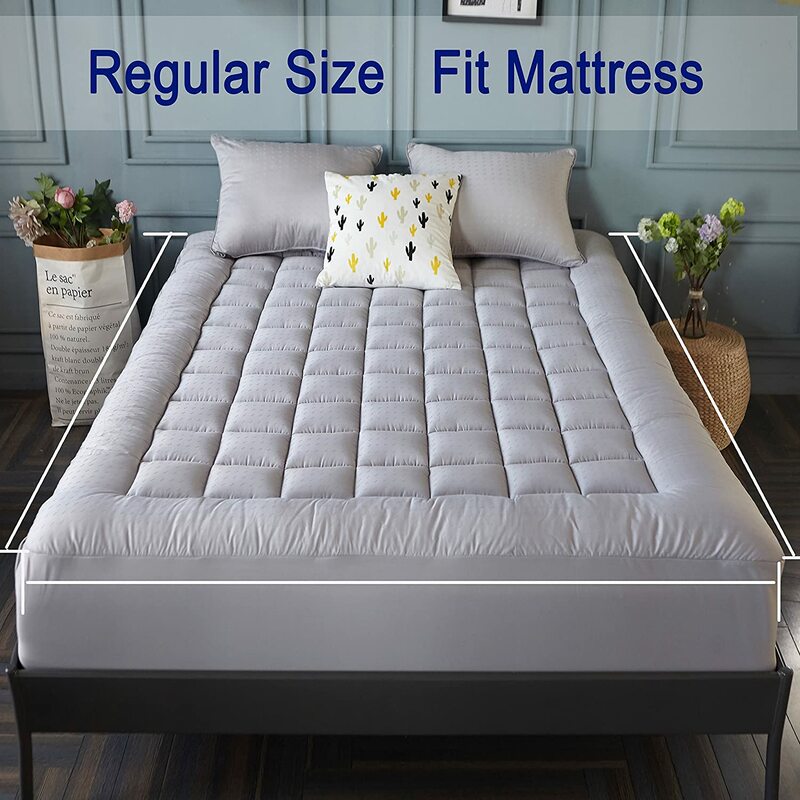 Fit All 8-21 inch Mattress: 8-21inch deep pocket, more suitable for your mattress pad, so that you don’t have to worry about the height. Exquisite Workmanship: High elastic elastic band, less easy to break, a more comprehensive package of your mattress, will not lead to falling, so you don’t have to worry about the quality. TOP NBH2O TECHNIQUE: In order to resist the infestation of dust mite and acarid all sidely and permanently, Tastelife adopts the NBH2O technique, which can anti bacterial and water-resistant , and is ventilative and Allergy Relief. The waterproof barrier protects your valuable mattress from spills and accidents; isolated mold and mildew with its breathable material.Soft and silent protection that doesn’t disrupt your valuable sleep. HYPOALLERGENIC AND ANTIMICROBIAL: In this new season, Tastelife combines deep-layer anti-acarid function and super soft combed cotton material perfectly, starts the new idea of ‘Naked-sleep Degree of Super Soft and Anti-bacterial’ with a high quality hypoallergenic 80% cotton & 20% Polyester blending surface and NBH2O TPU back coating; Extends the life of your mattress. EASY TO KEEP IT CLEAN: Machine washable, which adds the convenience of washing and drying easy. Material: Made of 100% 300TC cotton.62 oz High quality fitted combed cotton,gives you comfortable feelings without extra heat or sweat. Feature: Luxury 300TC cotton makes a neat and cool feeling when you sleep. The filling is ultra fluffy multiporous fiber filling. It’s also called cloud down alternative fill, a state-of-the-art fiberfill that has the feel of authentic goose and duck down without the feathers, poking or allergies. It’s also clean and dust-proof. Mites resistant. 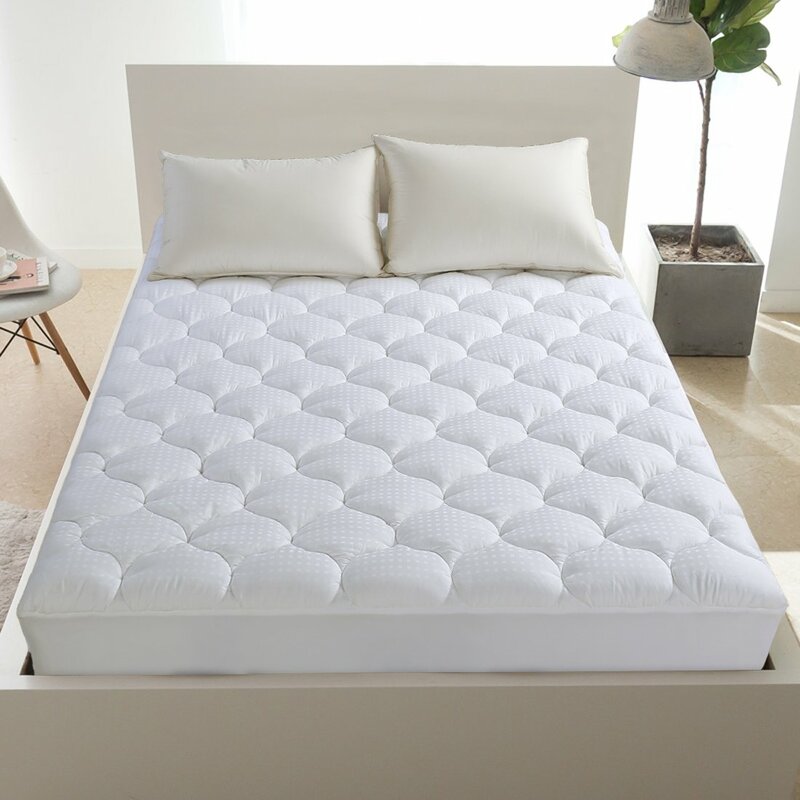 Compared to the diamond quilting seam, this design with new shape is more soft and supportive.Square jacquard better cover the whole mattress .Elastic fabric pocket makes it installed easier. 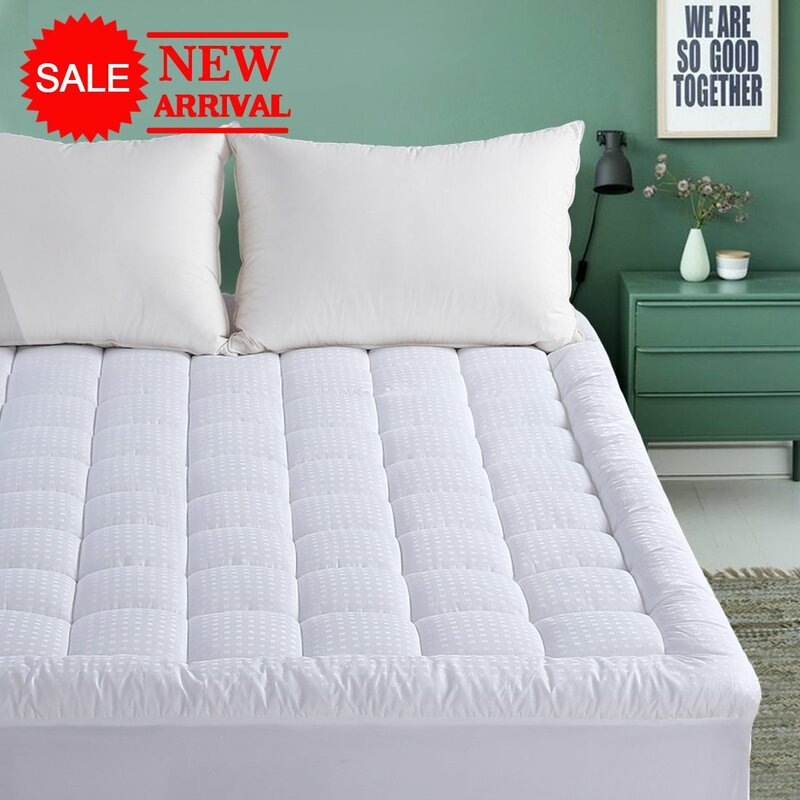 100% 300TC cotton is soft and it can be folded up easily.Fully enclosed design, durable high-quality elastic band，bed sheets will not slide on it.It protects your expensive mattress from stains and allows them to be washed away more easily comparing other similar items. Care: Despite of the cover is cotton, the spilled fluid can be wiped easily. Machine washable.Tumble dry on low.No bleach.Easy maintenance.Natural drying. 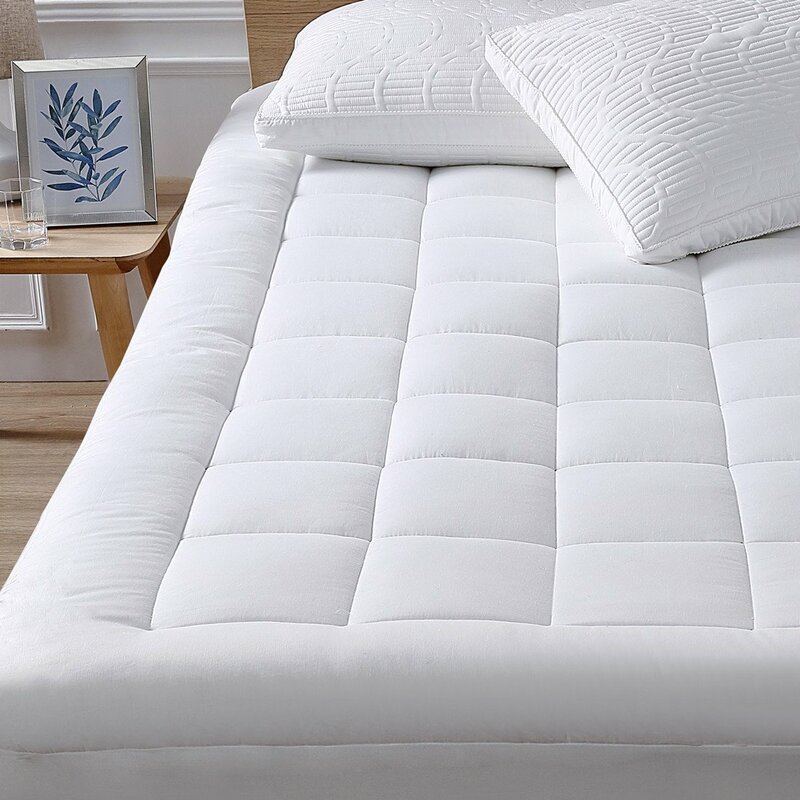 COMFORTABLE AND BREATHABLE: The luxury mattress topper is like a cloud can reduce mold and mildew with its breathable material.gives superior comfort against your skin without extra heat and sweat. 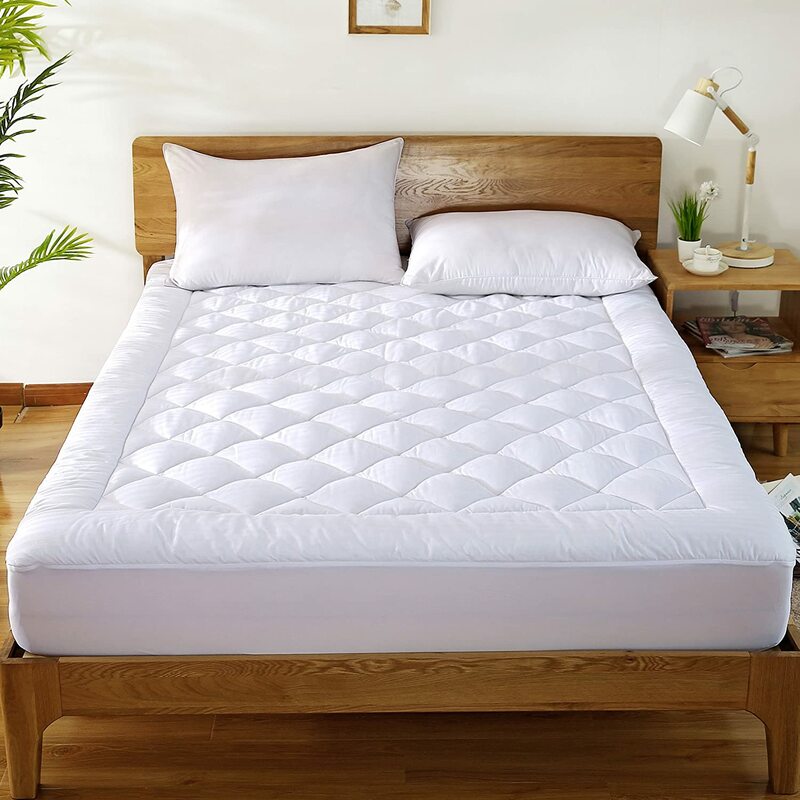 HYPOALLERGENIC AND ANTIMICROBIAL: The mattress pad can not only keep your mattress free of stains, but prevent exposure to dust mites and other potential allergens, offering sweet nights without runny eyes or stuffy noses. PERFECT FIT: Super Large Stretchable Sides, Will Hug Your Mattress Tightly & Stay In Place! ALLERGY FREE! Soft and comfortable, Not too thick and not too thin, Easy to put on the bed. EASY WASH & CARE: Machine Wash And Dry, Machine Wash In Cold, Do Not Bleach, Tumble Dry Low, Do Not Iron. MATERIAL: Cloud-like microplush top creates a super soft and cozy surface, generously overfilled fibers to add an extra layer of softness, noiseless and breathable for all season. 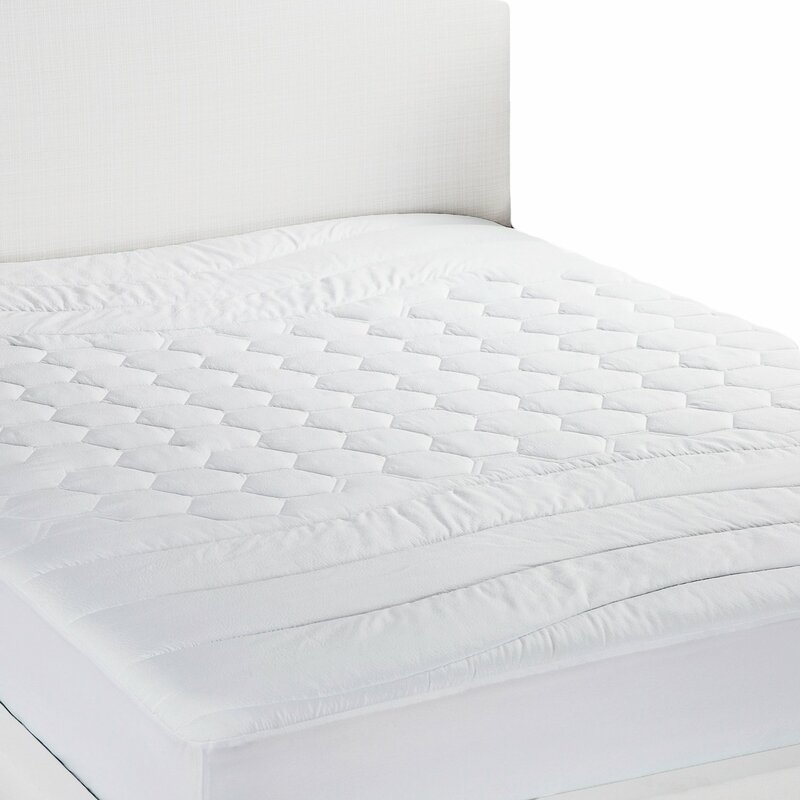 ADVANTAGES: The pad protects your mattress from unwanted stains and spills, and allows them to be washed more easily compared with similar products. Fully hypoallergenic, protect against allergens and bacteria, assure you a night’s sound sleep without getting up runny nose or red eyes. 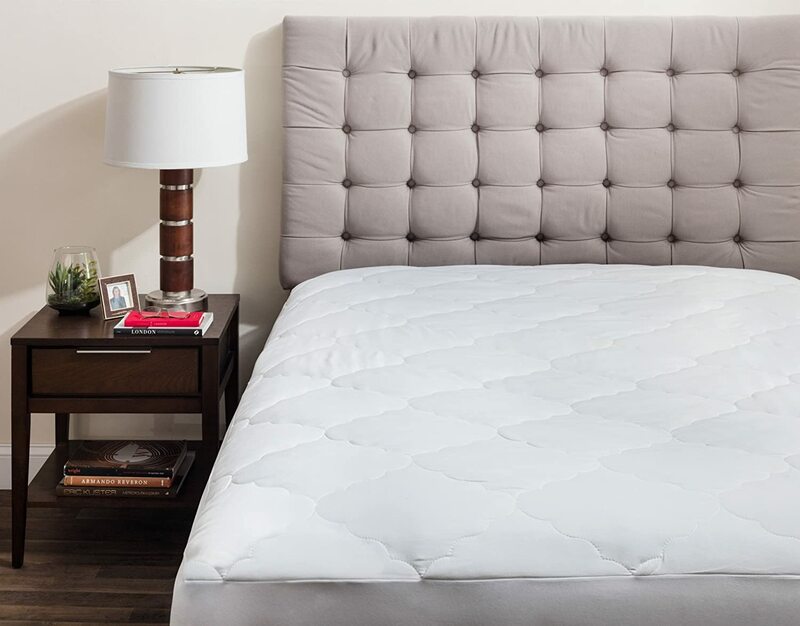 CHIC AND LUXURY DESIGN: This mattress pad is quilted with a wavy channel pattern. The Expand-a-Grip stretchy skirt lends a contemporary look to your bed and fits extra deep mattresses up to 14.5″ to keep it secured. Fully – elasticized fitted sheet style automatically pulls excess material under the mattress to ensure a great fit. 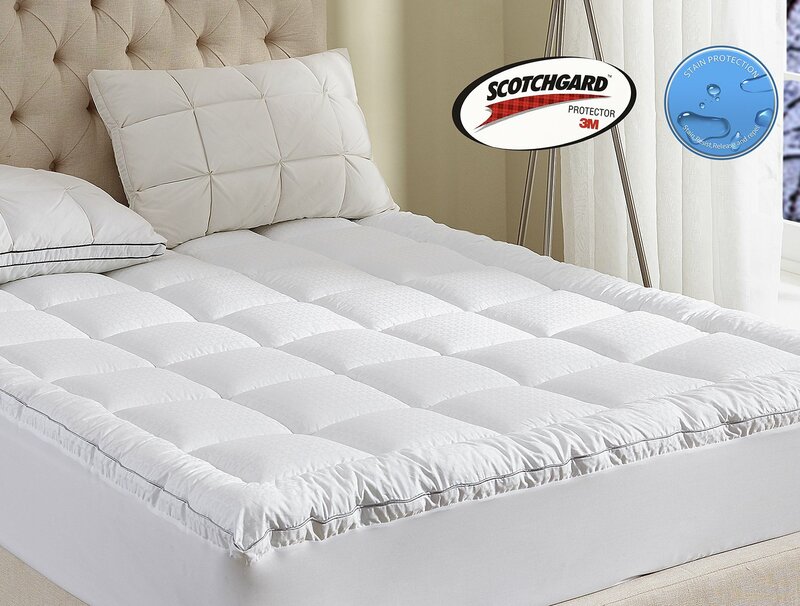 With this mattress pad, you will get rid of any shifting problem and enjoy a worry-free night of sleep. Baa soft, clean sleep surface you can’t wash your mattress with the Weekly laundry. Keep your mattress clean with the Linen Spa mattress pad. It’s machine washable and dryer safe for a constantly clean and comfortable sleep surface. Cozy softness a soft microfiber cover is backed with hypoallergenic down alternative fill for cozy comfort. 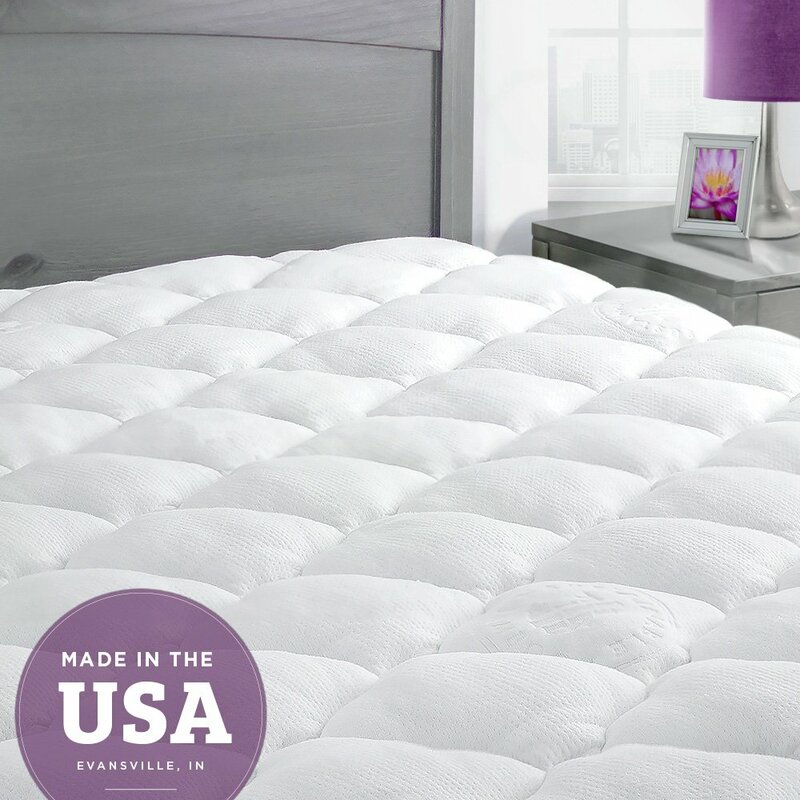 The entire mattress pad is diamond-quilted to improve breath ability and keep the fill smooth and even. 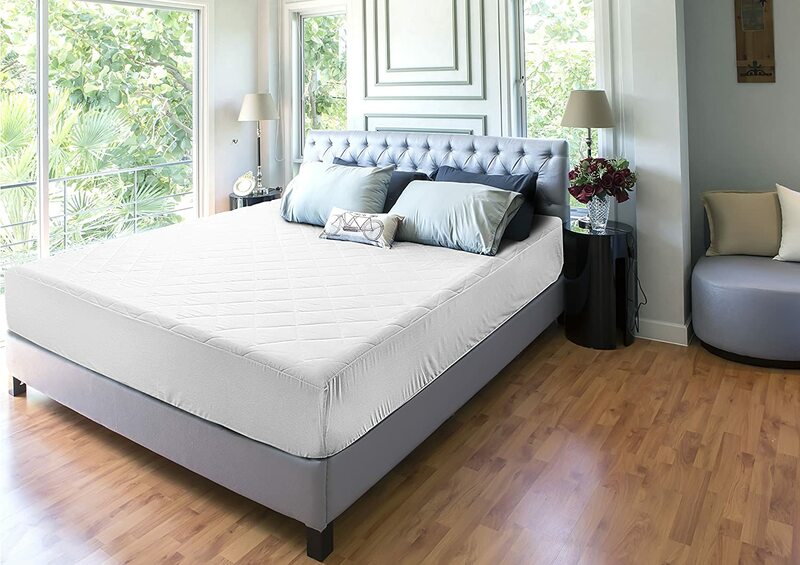 This breathable mattress pad features an elasticized skirt that provides a smooth, even fit. Pad is designed with deep pockets and a stretch fit to accommodate mattress depths up to 18 inches. 10% OFF LIMITED TIME PROMOTION FOR NEW ARRIVAL SALE.ORDER NOW! 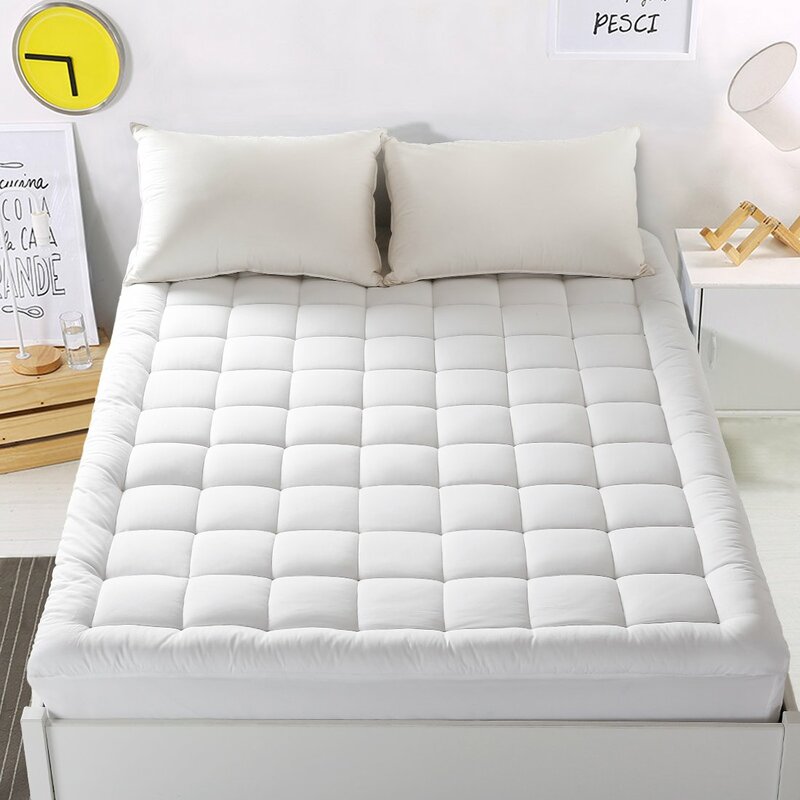 HEALTHY & BEAUTIFUL: 300TC 100% Cotton Surface with 1CM Square Jacquard.It is Breathable,Noiseless and No Static and Makes You Sleep Well Every Night. DEEP POCKET: California King Size Mattress Pad 72×84 inch. 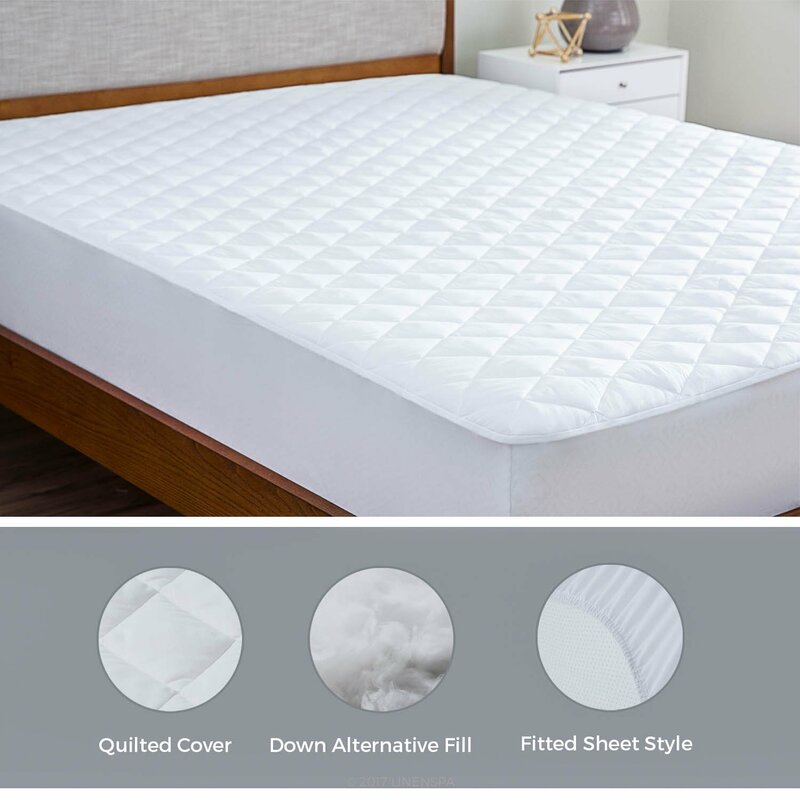 The 18-inch Deep Pocket can fit Mattress 8″-21″ Thick.130GSM Single-track Elastic Fabric Surrounds Mattress in 360-degree to Avoid it Moving. MACHINE WASHABLE & DRYABLE: Bring 2 Mattress Pads Home and Wash Them Regularly to Keep Bed Clean for Your Health.